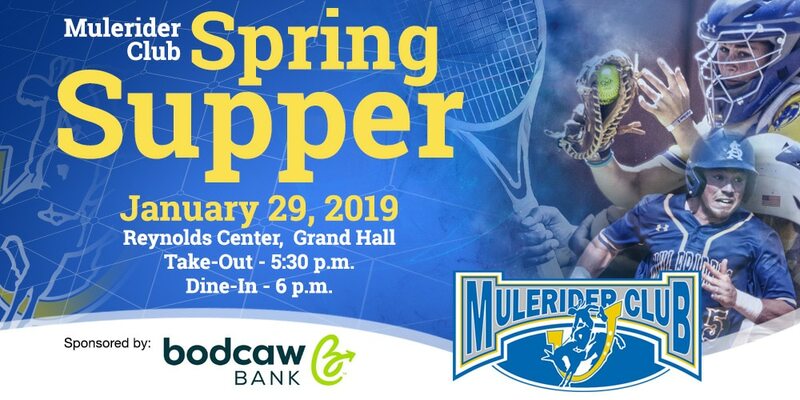 The Athletics Department and Mulerider Club Advisory Board Members are pleased to announce it is almost time for our fifth-annual Mulerider Club Spring Supper Fundraiser. The event is going to take place on Tuesday, January 29 at Reynolds Grand Hall at 6 p.m. This year’s Spring Supper Fundraiser tickets are being sold for $25 each and are available only in advance of the event as there will be no tickets sold at the door. Ticket availability will also be limited to the first 150 sold. Carry-out or dine-in options are available with carry-out orders able to be picked up at 5:30 p.m. the night of the event with a drive-thru service available on the west side of the Reynolds Center. The meal will feature a generously-portioned center-cut pork steak as the main course and will also include macaroni and cheese, potatoes, salad, rolls, and dessert with water and/or tea for refreshments. Shortly after the supper is served, guests in attendance will have the opportunity to hear from head coaches of SAU’s spring sports. Among those that will be speaking will be: Jason Anderson (Softball), Greg Owen (M/W Tennis), Justin Pettigrew (Baseball), and Tim Servis (M/W Track). To purchase tickets, please contact Lynn Disotell at 870-235-4102 or eldisotell@saumag.edu .